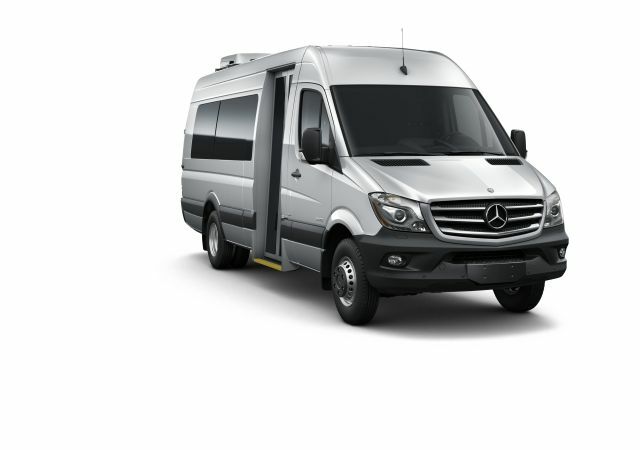 With room for 12, the Mercedes-Benz Sprinter Passenger Van features an interior standing height of up to 6’4” that gives everyone plenty of room to move. The Mercedes-Benz Passenger Van also includes a fuel-saving standard 4-cylinder 2-stage turbo diesel engine, an optional 4x4 with on-demand four-wheel drive (available only on 144” wheelbase model). Plus, achieve up to 90% lower emissions than an equivalent gasoline-powered vehicle with the Super Ultra-Low Emission Vehicle (SULEV) option for fleet customers (Available for 4-cylinder only. Requires option code MH8). Interior Height 64.1 in., high-roof 76.4 in. Turning Radius standard 23.8 ft., 170"wb 27.3 ft.
Wheelbase standard 144 in., optional 170 in. All Sprinters come in the four-wheeled 2500 models or rear-double wheeled 3500 models with four- and six-cylinder clean diesel options. All Sprinters are powered by a 3.0-liter BlueTEC diesel engine and all versions are equipped with a number of Mercedes-Benz safety features — ESP stability and rollover control, ABS anti-lock brakes, Brake Assist and traction control.